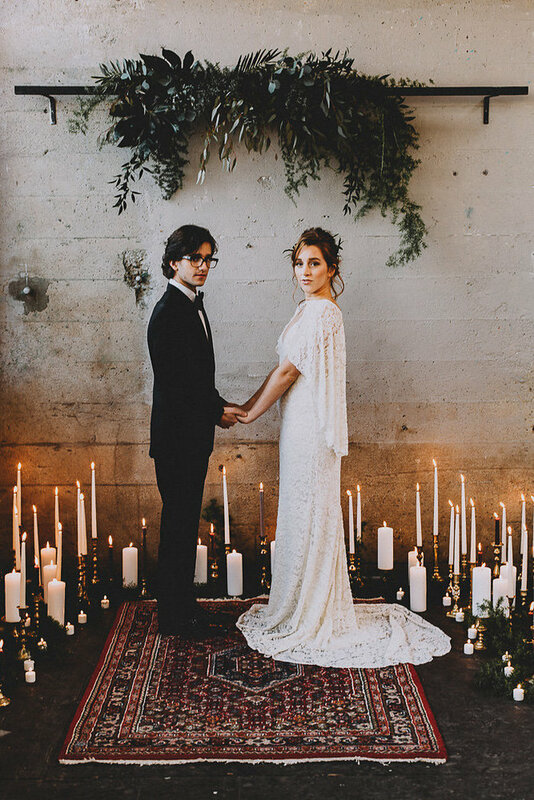 The talented Tessa Shannon photographed today’s dreamy styled shoot set in a hip warehouse space in Vancouver. 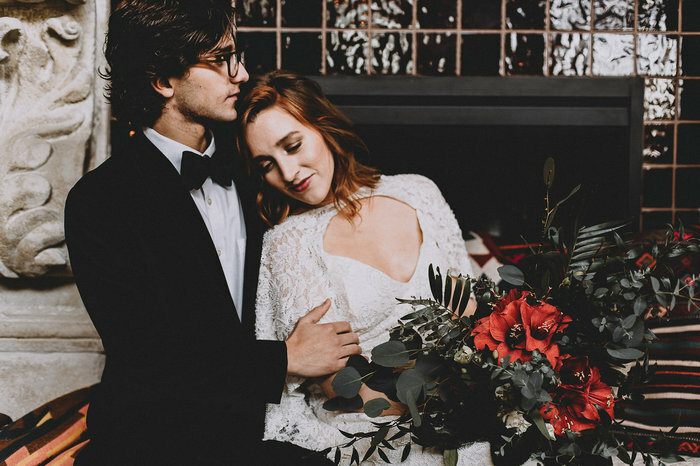 We love everything about this shoot – from the gorgeous florals to the stunning gown to the fantastic industrial chic backdrop, this shoot has it all! The venue was the Settlement Building. The main shoot took place in their rare, industrial warehouse space. 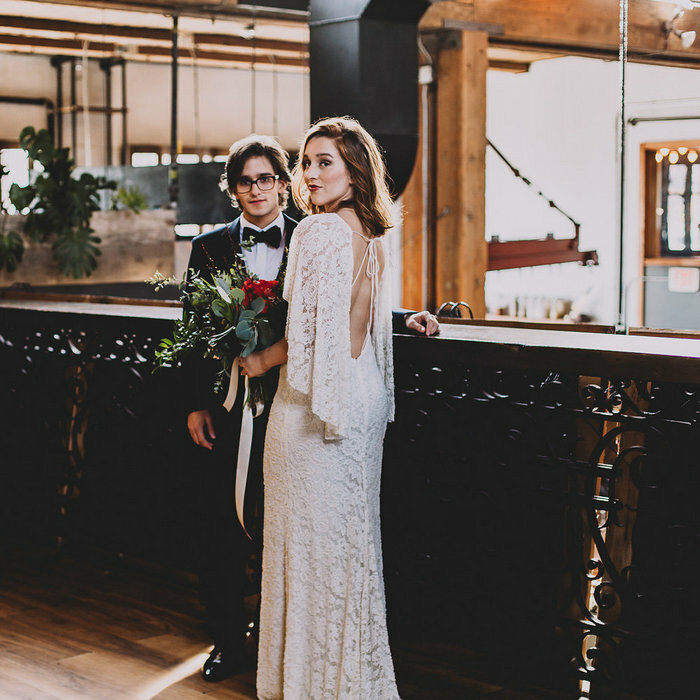 Briar from Epic Events took care of the ceremony space, with her rentals from Past Pieces, along with the help of Kerstyn from Our Little Flower Company. 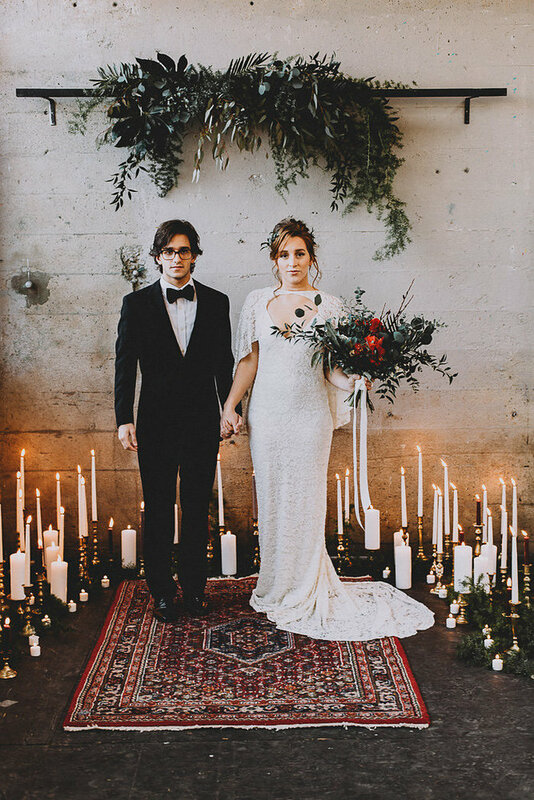 She showed how gorgeous a simple industrial space can be with lots of candles, a refined rug and lots of greenery above to soften the space. 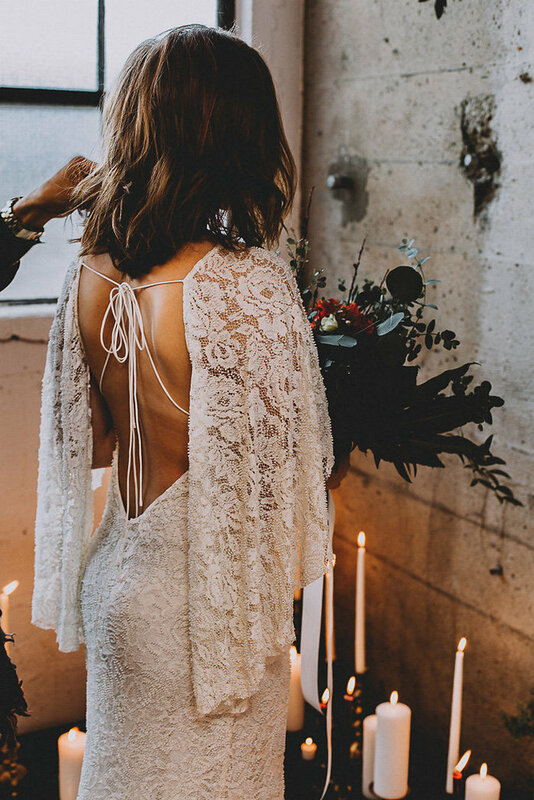 The bride was wearing the Comet Gown by Rue De Siene, it’s a stunning lace gown with a deep cutout neckline, large short sleeves that remind of wings and a gorgeous open back with straps to tie in a bow. Coco Manzano worked his charm on the models hair: the first hairstyle was an updo with an olive branch, and the second was loose wavy hair. 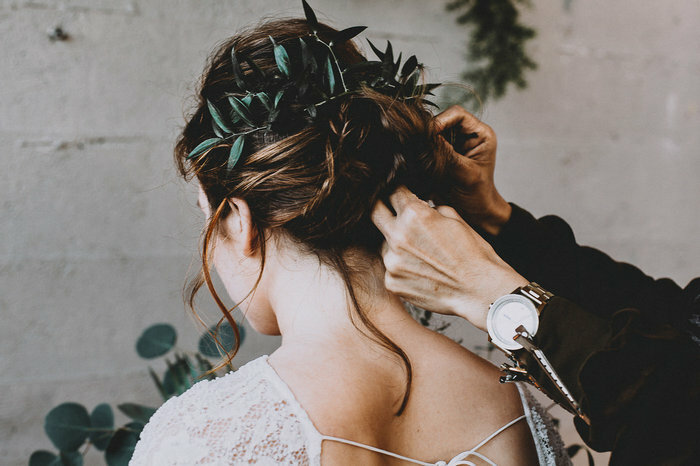 Messy hair is a huge trend now, and the stylists followed it. The groom was wearing a classic black tuxedo. 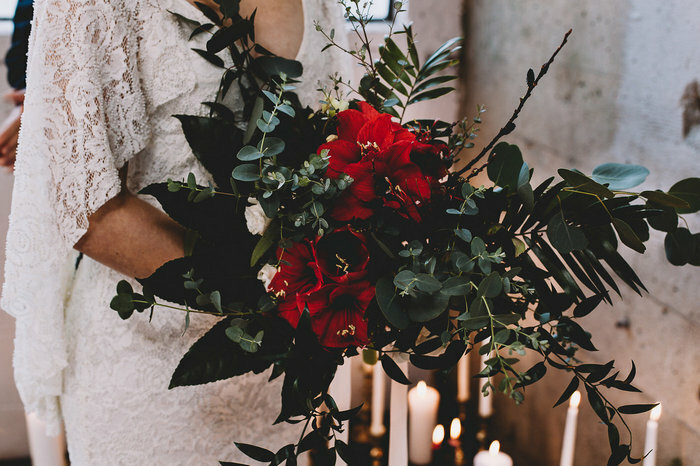 The bride was carrying a gorgeous textural bouquet in greens, white and red, with some branches and sticks, it was made by Kerstyn from Our Little Flower Company. 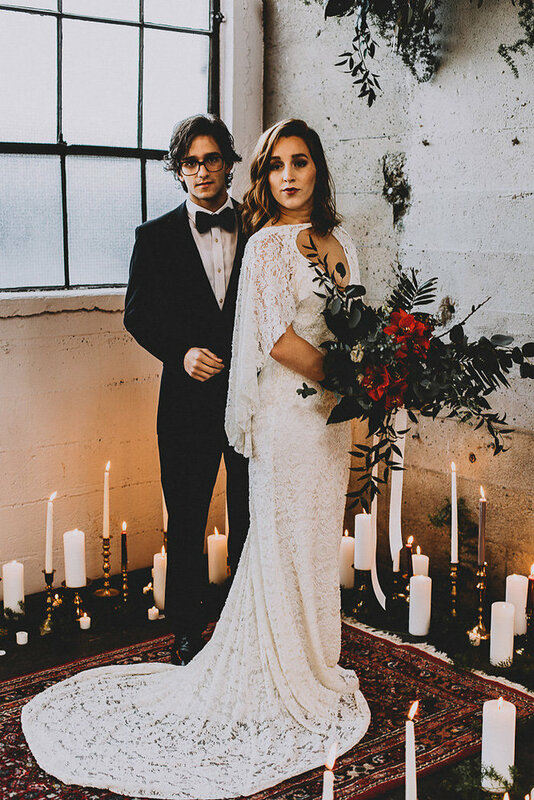 This shoot is a great source of inspiration for the couples that are going to rent an industrial space for their weddings and are wondering how to pull it off right. Enjoy!